The evolutionary level that could satisfy all these requirements was the 4th – Quadrality. And when I started to explore it as a system, I found how all cultures – and the religions and sciences within them – had an awareness of energy existing as a range of values with four divisions. The very first step I then completed was the archetype for this energetic realization – the Four Pathways to Light and Truth. Built upon core teachings from the realms of Religion and Science, it held that all paths born from Light and Truth energetically reflected in themselves all others. My quest for the Rules and Structure of existence soon led to the Quadralitic Cube, which I saw was the paradigm for the long-sought-after Blueprint for Creation. 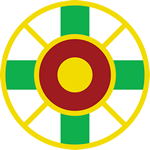 Using as my roadmap the Izunome Cross – sacred symbol for the Age of Light designed by Mokichi Okada – I called it The Totality Of God because the God it sought to represent could have no exclusions. But for Quadrality to be considered its governing system, it would have to be so powerfully evident in creation as to clearly preexist the event, and it would have to model all existence – inorganic and organic. The ability to model the periodic motion of energy for light, sound and heat would clearly establish the Quadralitic Cube as the paradigm for the Universe in all its inorganic glory. But only by also being able to model organic creation would it be truly unifying. And the very same symbolic Cube did just that when we discovered how it embodied the genetic structure of DNA. This meant that not only was the Universe designed in advance, but anything that having DNA would define as living – or organic – within it. While I feel that the evidence for it may already, or soon, exist, quite possibly the theory I’ll propose will never be proven. So, it may never be able to fulfill the previously noted requirement for one. But, I will call this a theory, nonetheless. After all, it took many years to prove all of Einstein’s Theories of Relativity. Yet eventually, scientists did. Hence, I’ll withhold nothing from the realm of 21st century possibility, including a proof for this. Let’s call it the Theory of Harmonic Creation. Simply stated, it is: The existence and evolution of the Universe and all within it can be understood in terms of the principles underlying the creation of harmonics, the perfected merging of Music and Mathematics – the spiritual and physical reflections of the same Truth within the Movement. The aforementioned Rules are The Rules of Quadrality, which I had applied to arrive at the Structure of the Quadralitic Cube, paradigm for all non-chaotic vibrational and rotational movement of energy. But as pointed out in the first reprinted passage, the Quadralitic Cube was also shown to model the structure of DNA. So, DNA was not an accident, but a pre-designed existence inherent in the Universe since before the Universe itself existed! every state of being is a unique combination of harmonically structured energetic vibrations born from four fundamental frequencies of universal oscillation. These harmonic vibrations provide any state with the knowledge and means required to align with or disengage from another state for the greatest good of the Individual states involved as well as the Collective state they are within. The second half of the principle establishes the Universe’s Prime Directive – seeking the greatest good of the individual and its collective. This means that while Order and Chaos are both requirements for existence, it is Order that must ultimately rule. And the first half of the principle maintains that all energy systems have at their foundation, in a particular harmonic balance, four fundamental frequencies that allow each system to do so. This is why to my way of thinking String Theory has its drawbacks. And from the scientific community’s viewpoint, the most difficult for it to overcome may be its provability. Admittedly, Harmonic Creation has them, too. As I earlier acknowledged, it is a philosophic construct, and I recently reminded you of how the scientists feel about those. But I knew from the start I would never be able to make them completely happy. And the committed theologian will likewise not be pleased. However, I have not left your acceptance of my ideas totally to a matter of faith. I’ve tried to balance both sides of all equations, including the one faith has with evidence; and Harmonic Creation does provide us with some testable predictions. One clearly concerned the remaining resonant frequencies in the Great Pyramid of Giza. That was perhaps the biggest limb I climbed out on, because someone does know what they are and someday may release them. But I feel the most notable discovery could be the four resonant frequencies at the Big Bang. After all, according to Harmonic Creation’s Principle of Harmonic Alignment they had to be there, and the evidence for them could be within the CMBR. Even with the creating four frequencies spanning the macrocosm and the microcosm, there should be evidence for all four within it determined through the same connective process of harmonic multiplication and division that allowed Susan Alexjander to bring the frequencies of DNA within the range of audible sound. I’m not claiming there are only four frequencies, but four discernible tone centers – as was evident to me when analyzing the frequencies Ms. Alexjander found in the four DNA bases. This quote establishes two things. The first is that data collected by independent researchers on the constituent frequencies of the base elements of DNA afforded me evidence for the Principle of Harmonic Alignment, and thus its umbrella theory. As stated, the Theory of Harmonic Creation is admittedly more philosophy than physics, what I’ve glibly referred to as Philosophysics, a term I coined in 2002 around the time I was doing my DNA research. Yet, its understanding is essential to the Laws of Being and Existence, which have scientific significance. For instance, there could be no balanced equations in Mathematics or Physics without the Principle of Balance, no chemical, biological, or natural transformations without the Law of Order, no synchronized vibrational or electromagnetic systems without Harmonic Alignment, and no continuity of genealogy in evolution without Dynamic Stability. And once determined, though not necessarily with the same root, do they then also follow the same music intervals as those within DNA and the Great Pyramid? Not only would they resolve the coexistence of Consonance and Dissonance, as well as the former being the ruling principle, but they’d clearly establish God’s providence in providing them. Again, the God in reference is not the "Old Man in the Sky," but that which I described earlier. An atheist might retort, "Even if the principles you’ve proposed are shown to be true, couldn’t these harmonic relationships simply be inherent in the nature of energy, and God has nothing to do with it?" But according to my definition of The Totality Of God, what is the energy whose nature has that inherence? And be assured it is more than the energy that can light up your room or run your car, but energy that was wise and cared enough to insure the Chaos of the Big Bang would become the Order in the CMBR. Moreover, inherence implies preexistence – of both the energy and its operational properties. Neither were accidents. But there is one additional, and quite intriguing, musical association I can speak of with confidence. We’re dealing with two chords derived from the same four notes, one chord being a minor, and the other, diminished. Both are in harmony to their absolute frame of reference, the F# major scale. However, the roots themselves have a special relative relationship in that context. We’ve considered the notes in the F# major scale, and from them drew conclusions as to the four fundamental tones in the Great Pyramid. We then found a powerful corroboration in the harmonics of DNA. We also then came to realize that these four tones had a dual-chordal relationship, one based on F# as its root, the other on D#. But specific notes aside, there is a fundamental key relationship in all major scales. Every major key has its relative minor key. It contains the same notes as the major key and is identified by the same key signature. Only the root changes. The root of the relative minor key is found at the interval of a 6th above the major. For the key of F#, the relative minor is D#! Can there be any doubt now about the physical perfection that exists throughout the Universe, or the Spiritual Perfection that created it? Not for me. The entire process whereby I arrived at these four frequencies has been excerpted in The Four Fundamental Frequencies of Universal Oscillation – the Harmonic Connection Found Within the Resonant Tones of the Great Pyramid of Giza and the Base Elements of DNA. This last quote from it reveals that the ability to balance Consonance with Dissonance requires that the root of the relative minor key must be contained in the four tones. This means, regardless of the major key a given system’s chord resonates to, the major 6th interval from the root must be included. This will be extremely important when we later analyze the data from the CMB. The F#m6 obviously does that for DNA. But an F#M6 would do so as well! (m=minor, M=major) Its relative minor chord is D#m7. The names on the left refer to a tone’s position in a diatonic scale. With the tonic all the same, the mediant seems to be the tone that establishes Means vs. Extremes. Only the intervals in the Means forms can be satisfied by the same four chromatic scale tones. No four tones can satisfy those in the Extremes forms – a musical confirmation of quadralitic truth! When the four basic chord forms are assigned to the Four Realms of Quadrality (implied in the above 4x3 grid), the major and minor chord forms both appear in the Consonant, Spiritual Root Realm. They can express Consonance and Dissonance in that Realm as that Realm would know them, but not in the Universe at large. It is the minor and diminished chord forms residing on each side of the Balancing Center – one in the Consonant, Spiritual Realm, the other in the Dissonant, Physical Realm – that do. So, the DNA chords are indeed the best. And theirs are the intervals we would hope to find in the CMB. The Big Bang theory predicts that the early universe was a very hot place and that as it expands, the gas within it cools. Thus the universe should be filled with radiation that is literally the remnant heat left over from the Big Bang, called the "cosmic microwave background radiation," or CMB. . . .
Today, the CMB radiation is very cold, only 2.725° above absolute zero, thus this radiation shines primarily in the microwave portion of the electromagnetic spectrum, and is invisible to the naked eye. However, it fills the universe and can be detected everywhere we look. In fact, if we could see microwaves, the entire sky would glow with a brightness that was astonishingly uniform in every direction. The CMB radiation was emitted only a few hundred thousand years after the Big Bang, long before stars or galaxies ever existed. Thus, by studying the detailed physical properties of the radiation, we can learn about conditions in the universe on very large scales, since the radiation we see today has traveled over such a large distance, and at very early times. . . . Since the universe was so very hot through most of its early history, there were no atoms in the early universe, only free electrons and nuclei. (Nuclei are made of neutrons and protons.) The cosmic microwave background photons easily scatter off of electrons. Thus, photons wandered through the early universe, just as optical light wanders through a dense fog. This process of multiple scattering produces what is called a "thermal" or "blackbody" spectrum of photons. According to the Big Bang theory, the frequency spectrum of the CMB should have this blackbody form. This was indeed measured with tremendous accuracy by the FIRAS experiment on NASA’s COBE satellite. Eventually, the universe cooled sufficiently that protons and electrons could combine to form neutral hydrogen. This was thought to occur roughly 400,000 years after the Big Bang when the universe was about one eleven hundredth its present size. Cosmic microwave background photons interact very weakly with neutral hydrogen. The behavior of CMB photons moving through the early universe is analogous to the propagation of optical light through the Earth’s atmosphere. Water droplets in a cloud are very effective at scattering light, while optical light moves freely through clear air. Thus, on a cloudy day, we can look through the air out towards the clouds, but can not see through the opaque clouds. Cosmologists studying the cosmic microwave background radiation can look through much of the universe back to when it was opaque: a view back to 400,000 years after the Big Bang. This "wall of light" is called the surface of last scattering since it was the last time most of the CMB photons directly scattered off of matter. When we make maps of the temperature of the CMB, we are mapping this surface of last scattering. 1 – The CMBR, or "cosmic microwave background radiation," is the remnant heat left over from the Big Bang. 3 – The further away the source of light is, the longer it has taken to reach us, and thus the closer its origin is in time to the beginning of the Universe. 4 – The CMBR that exists around us today came from a distance so far out in space that its origin was only a few hundred thousand years after the Big Bang. 6 – The creation of Hydrogen, about 400,000 years after the Big Bang, ended the ability of photons to freely scatter off electrons, resulting in the CMBR – the "surface of last scattering." 7 – The opacity of the "surface of last scattering" prevents scientists from looking any closer to the moment of the Universe’s origin in the Big Bang. The CMBR thus provides a picture of radiation they can map of that event in the Universe’s history. 8 – The instruments in COBE and WMAP are able to detect minute fluctuations in the uniform CMBR, which can furnish information about the origin of galaxies and measure the basic parameters of the Big Bang theory. These last two points are of particular importance in providing justification for my present study because I believe, and have stated so since my original analysis of the DNA/Great Pyramid resonant frequencies, that within the CMBR’s "wall of light" could be imprinted the frequency intervals of Harmonic Creation. To determine if it is even possible for the CMBR to reveal this information, we must understand what a "blackbody" is, since that is how the CMBR frequency spectrum is described. Blackbody, in theoretical physics, [is] an idealized object that absorbs all the radiation that strikes its surface, without reflecting any of the radiation or emitting any of its own. No such object is known to exist, although a surface consisting of carbon black may absorb all but about 3 percent of incident radiation. In theory, a blackbody is therefore also a perfect emitter of radiation, and at any specific temperature it would emit the maximum amount of energy available from a radiating body, at any wavelength, through temperature alone. It was through the failure of attempts to calculate ideal blackbody radiation in terms of classical physics that the basic concepts of quantum mechanics were first developed. Because light is the oscillation of a continuous electromagnetic field, the study of blackbody radiation reveals how continuous fields can have a temperature, something which contradicts classical physics. Because the thermal state of light was so confusing before the advent of quantum mechanics, the 19th century arguments that light has a thermal equilibrium state were made very carefully. An object at some fixed temperature T, like an oven, is observed to glow. No matter how the oven is constructed, so long as the oven is not too shiny, the color of the light only depends on the temperature. Since color is the directly visible measure of the wavelength, this observation means that light at different temperatures has a different distribution of energy among the different wavelengths. The amount of energy E per unit volume in wavelength λ at temperature T is called the blackbody curve. Detailed experiments revealed that the blackbody curve only depends on the temperature, not on the emitting body. This suggests that light does in fact come to thermal equilibrium just like anything else, that the concept of light at temperature T makes sense. . . .
Two things that are at the same temperature stay in equilibrium, so a body at temperature T surrounded by a cloud of light at temperature T on average will emit as much light into the cloud as it absorbs. . . . The principle of detailed balance says that there are no strange correlations between the process of emission and absorption: the process of emission is not affected by the absorption, but only by the thermal state of the emitting body. This means that the total light emitted by a body at temperature T, black or not, is always equal to the total light that the body would absorb were it to be surrounded by light at temperature T.
When the body is black, the absorption is obvious: the amount of light absorbed is all the light that hits the surface. For a black body much bigger than the wavelength, the light energy absorbed at any wavelength λ per unit time is strictly proportional to the blackbody curve. This means that the blackbody curve is the amount of light energy emitted by a black body, which justifies the name. . . . In astronomy, objects such as stars are frequently regarded as black bodies, though this is often a poor approximation. An almost perfect blackbody spectrum is exhibited by the cosmic microwave background radiation. Hawking radiation is the hypothetical blackbody radiation emitted by black holes. A description for a published WMAP image of the CMBR, included in this article, adds this point: "It has the most precise thermal emission spectrum known and corresponds to a temperature of 2.725 K [for Kelvin, the base unit of thermodynamic temperature] with an emission peak at 160.2 GHz." I began my present study by reviewing the technical papers provided on the WMAP site for the results of the data gathered over the course of its mission. My focus was on the 1st year studies, done in 2003, and the 7th, the latter being the most recent released – from the beginning of this year. Quite frankly, understanding the bulk of the information was beyond the scope of my undergraduate engineering degree, almost like a foreign language, with the exception that you couldn’t begin to discuss it after cruising through a set of home study CDs! A tremendous amount of specialized training is required. Nonetheless, I had sufficient skill to differentiate the information I couldn’t understand from the information I could, as well as distill from it any relevant wisdom it might contain. And one such bit was particularly eye-catching. It was that the WMAP team had used instruments to detect the CMBR in five frequency bands centered at 23, 33, 41, 61, and 94 GHz (Gigahertz=109 Hertz). They had been chosen to be near the frequency at which the ratio of CMB anisotropy to the contaminating foreground is at a maximum. This last point is significant because in addition to measuring the CMBR entering the instruments from nearly 400,000 years after the Big Bang, they are also picking up the "noise and dirt" in those ranges coming from our present-day galaxy. And one of the challenges of the mission was to be able to separate the two data streams in order to clean out the latter and better determine the former. I confirmed the time-frame of the contamination through email correspondence with Prof. Edward L. Wright, a member of the WMAP team. I’d quoted his superb online cosmology tutorials in the First Print Edition regarding Relativity, and he seemed open to inquiries from the "outside world." I was seeking to resolve if indeed there existed a frequency-based sonic paradigm for the Universe, and I figured who better to ask than one of the scientists studying its earliest recording. So, I sent along five questions, which he kindly answered. His comments were not quite what I expected, or initially hoped for. He confirmed that the galactic contamination is present-day. He also replied that the five frequency bands do not reflect the entire frequency spectrum measured, they were chosen because they are easily available waveguide components at the WMAP bands, and they have no particular relationship to the CMBR data. Moreover, to my last question as to whether the CMBR data has shown frequency characteristics that could be interpreted as "tone-centers," much as the DNA data had, he said no, the CMB is just a blackbody. His last point at first seemed like a setback to arriving at a confirmation of my theory, and I knew that to move any further forward I’d have to understand what a blackbody is – the reason for the detailed description of it earlier. I’d also have to be clear on his other points, which I’ll review first. Having the galactic contamination present-day is important because it helps us to grasp where the CMBR we’re measuring is coming from. Ever since Zero Moment the Universe has been expanding, and light along with it, which answers how light at universal distances can seem to be moving faster than its known speed limit. The CMBR is coming from the moment of its origin and at a location far enough away in both time and space to have radiated it. And while someone at that distance from us would be examining the CMBR originating here, it wouldn’t be from our present-day. As to Prof. Wright’s answers concerning the frequency bands, I can add that upon further study I learned the COBE mission preceding WMAP had three frequency bands, similar to but not exactly the same as WMAP, and the recently begun Planck mission has nine. Many of those further examine the CMBR spectrum above WMAP. Those chosen for WMAP are indeed, as Prof. Wright noted, readily available, and are, as the Wikipedia article Microwave shows, five of fourteen Microwave frequency bands (with some overlap) defined by the Radio Society of Great Britain. Blackbody, in theoretical physics, [is] an idealized object that absorbs all the radiation that strikes its surface, without reflecting any of the radiation or emitting any of its own. Blackbody radiation is light in thermal equilibrium with a black body, light radiation with a given temperature. It is the reference thermodynamic equilibrium state of light. Detailed experiments revealed that the blackbody curve only depends on the temperature, not on the emitting body. The principle of detailed balance says that there are no strange correlations between the process of emission and absorption: the process of emission is not affected by the absorption, but only by the thermal state of the emitting body. So, if the CMBR is a blackbody, why is studying it important if, as just noted, its blackbody state can’t tell you anything about it beyond the fact that it is a blackbody with a given temperature? The first reason is that knowing this is substantiation for the Big Bang theory of creation, which requires it. Second, confirming the CMBR is a blackbody means only its imprint is in the signal you measure from that moment in the Universe’s history. The third reason is that within its temperature signature are minute fluctuations, called anisotropies, and they can tell us a great deal about the early Universe, its material composition, and how that nearly uniform cosmic soup evolved into the stars and galaxies we see today. Given the temperature nature of the CMBR, how, then, does the concept of frequency fit into it? The answer is primarily that the laws of Physics for blackbody radiation, most notably Planck’s law, provide for a relationship between temperature and frequency, and the CMBR temperature of 2.725 K corresponds to an emission peak at 160.2 GHz. Moreover, that temperature-frequency relationship allows scientists to use instruments tuned to different nearby frequency bands to examine the CMBR at various points along its power spectrum. As I mentioned before, the WMAP mission chose five frequency bands to perform its measurements. For me to then resume my original query – to determine if there were a frequency-based sonic paradigm for the Universe evident in the CMBR – I considered that they might be a good place to begin. While Prof. Wright had said there were no "tone-centers" as such in the CMBR, and we now understand why, there was a reason the five bands had been chosen. They provide the greatest difference between the Universe’s CMBR and our galaxy’s present-day noise. Since these bands were noted as having center frequencies, I wanted to determine if there were some meaningful interval relationship in that occurrence. My analysis was simple. I took the five center frequencies and resolved them into the range of audible sound in the same manner as had Ms. Alexjander and Dr. Deamer with their DNA spectra. That range began with the "zero" octave of sound – the one in which the keys on a piano start. I could then compare their frequencies with the note-frequency charts readily available on the Internet for 12-TET tuning (that used in modern concert pianos). While examining the various technical papers available on the WMAP site, I had seen that these "whole number" center frequencies were the rounded-off numerical averages for the five frequency bands, and the results of the first seven years of the mission have refined them according to collected data. Hence, in the chart below, for each of the five bands I have listed the center average, the 1st year result, and the 7th year result. These are followed by their resolution into the lowest octaves on a piano. The final entries contain the frequencies of the 12-TET pitches closest to the resolved CMBR frequencies. I have divided this chart into two sections, to facilitate their analysis. The section on the left shows the five WMAP bands, as well as their numerical frequency averages and the published 1st and 7th year results.2 The section on the right shows their respective resolved frequencies. I decided to separate the two first so it would be easy to focus on the portion under analysis. But once I started to arrange the columns in this manner I realized their numerical similarity may be confusing. Be very clear that there is a decided difference. The values on the right are in Hertz, those on the left are in Gigahertz. That’s a difference in magnitude of 109 (1 followed by 9 zeros). The similarity is a coincidence, a result of their resolution into the lowest octaves on a piano. (These are generally also considered the lowest octaves of sound, since the audible range standard for electronics is 20-20,000 Hz. Synthesizers are capable of producing lower fundamental frequencies, but these would more be felt than heard, by humans anyway!) Let’s review the process of resolution next. Pythagoras established roughly 2500 years ago that the ratio a fundamental note has to the octave above it is 1 to 2. In other words, given any initial frequency, its first octave will be 2 times that frequency. Multiplication again by 2 gives the next octave, and so on. This process can be applied in reverse through division by 2 to arrive at the octave below a given frequency. This unifying truth between Music and Mathematics underscores the Theory of Harmonic Creation and its Principle of Harmonic Alignment. Any harmonic relationship found at one octave in the complete electromagnetic spectrum will apply at any other octave. This is the essence of a search for a sonic paradigm, a universal truth exhibited in the relationships that frequencies have to one another through harmonics. Easy enough. To complete the chart, just divide each source frequency by 1.074 and you’re done. Actually, you will arrive at a more accurate result if you divide the source frequency by 1.024 three times. This is due to the rounding of decimal places in the first method. (That multiplication of 1.0243 in the above equation is 1.0737418 to my pocket calculator’s accuracy.) While I began with the first method, the results in my chart were arrived at using the second. Quite frankly, it was done only for the sake of precision, as the difference is at most 0.02 Hz (21.42 in the above example). Now, for the analysis. The initial impression upon viewing the chart is that two of the five bands resolve close to a single 12-TET pitch. For the Ka band, its three frequencies are microtonally flat of B0 by -7.73 cents, an audibly imperceptible difference.3 (100 cents separates the 12-TET semitones, i.e., from B to C to C#, etc. The 0 following the pitch indicates it is in the zero octave.) For the W band, its three frequencies seem to straddle F2, beginning sharp and ending flat, from +4.61 cents to -14.07 cents difference, again imperceptible to all but the most discerning ear. So I think we’re safe in calling two pitches B and F. The other three bands provide the challenge. For the K band, its three frequencies are midway between E and F, with the data moving toward the very slight favor of E from Avg. to 7th year. (F0, -33.37, to E0, +46.29) Since +/- 50.00 is the middle, or quarter-tone, it is not close enough to E to call it that, and with the 1st year included (F0, -47.99) the K band is overall closer to F. (Their average distance from middle is 4.93 in favor of F.) Therefore, I’m inclined to go with F. Moreover, F has already been locked down as a pitch, which would make the K and W band pitches 2 octaves apart. This would also provide us with a four note sonic paradigm once we add the remaining bands. Let’s look at the V band next. Its three frequencies are midway between A and A# (A#1, -43.94, A#1, -49.74, A1, +43.51). With their average distance from middle being 0.17 in favor of A, I’ll make this very close call A as the V band frequency. That leaves the Q band as our final challenge. Its three frequencies are midway between D and D#. (D#1, -31.93, D#1, -44.67, D#1, -46.04) All three favor D#. Yet the data appears to be moving toward D from Avg. to 7th year. To make our determination, we need to consider a very important piece of data not included in my chart but mentioned earlier. It is that the CMBR has an emission peak at 160.2 GHz. And if you then resolve that frequency into our range, you arrive at 149.2 Hz. The closest 12-TET pitch is D3, with an offset of +27.69 cents. In other words, it is about an eighth-tone sharp of D3, and hence only an eighth-tone flat from the 7th year pitch. Therefore, my intuition is to call the Q band D, which puts it at 2 octaves below the emission peak. Moreover, I think it is reasonable to set the emission peak as the root of the chord formed by our four notes. Translated into the same octave, which the laws of harmonics allow, they become D, F, A, and B. That chord is Dm6, which contains the 6th interval required to balance consonance and dissonance through its relative minor, Bdim(b7). As a result, the intervals of the notes exhibited as the peak frequencies of the WMAP bands are identical with the intervals of the two chords in DNA, differing only in the root of the consonant chord, D vs. F#. With this, one might be tempted to say the harmonic parallel between the four resonant frequencies in the base elements of DNA and these four peak frequencies in the CMBR has been established and hence my sonic paradigm and its role in creation has been proven. Well, I need to be clear about what we have established and what we haven’t. What has been established is that the five frequency bands chosen for the WMAP mission have center frequencies that, when resolved into the range of sound, display the same intervals as the DNA chords. Granted, we had to make some determinations in pitch selection based on a combination of data trends and our own musical intuition. But our final choices were reasonable in that context and any others would have produced dissonant pitch combinations more in keeping with a Universe seeking Chaos rather than Order as its ruling principle. Nonetheless, we have shown little beyond that since those frequency-band intervals are not unique to the CMBR but are inherent in the bands themselves. As my detailed chart showed, while the CMBR data refined the exact center pitches for those bands in its context, the average frequencies weren’t far enough off to call for changing the conclusions, and at times even helped to determine them. So, perhaps we can find it more than just curious that our sonic paradigm is inherent in these five microwave bands. But certainly they are not all the bands that exist. Galactic foreground signals are distinguishable from CMB anisotropy by their differing spectra and spatial distributions. Multiple frequency coverage is needed to reliably separate galactic foreground signals from CMB anisotropy. WMAP observes with five frequency bands between 22 and 90 GHz. . . . The acoustic peak frequencies are specified in terms of the spherical harmonic index \ell. The units are cycles per circle, or dimensionless. They have nothing to do with the peak of the blackbody spectrum B_nu where nu has units of Hertz. OK, that was unexpected! What in the world are spherical harmonics? That expression was foreign to anything my background in musical harmonics had afforded me. And while my exploration of the System of Quadrality had led to how Music and Mathematics merge through common terms they use, like frequencies and harmonics, clearly I was verging on personally new territory. Before I let this lead me to doubting the thoroughness of my college education, a brief phone call to a close friend whose background was in physics helped me to realize that lack of this knowledge wasn’t something I should be ashamed of. He hadn’t heard of them either, indicating how specialized training can become at the Ph.D. level. Nonetheless, I knew at least a basic understanding of them would be required for me to grasp what Prof. Wright had said and then benefit from that wisdom. A Google search for "spherical harmonic index" left me even more confused, with everything from mathematical equations way beyond my expertise to dozens of fantastical 3-D images and movies depicting them. So, I gave another search a try, this time "spherical harmonics cmbr." The sixth entry down was "Physics For My Mom: Understanding the CMB. "5 Now, that looked promising! It ended up being a blog created by a postdoctoral associate at Fermilab (the second largest particle accelerator in the world, located outside of Chicago) known only as Hugh, to explain what he did so his parents could understand. I read this entry as well as the one following it, in which the concept of spherical harmonics was introduced and briefly explained as it applies to the CMB. I found it more than coincidental that these entries were just a few months old, written about the time I had gotten the inspiration to pursue my investigation after waiting more than eight years since my DNA analysis. Clearly, it would have been difficult for me to go further without their insights, as well as the lead they would provide (more on that, shortly). But to truly appreciate what he described, and then be able to pass it on to you, I felt I needed to read through his entire blog, which began early in 2009. As Hugh explained, the study of Physics is built upon the huge amount of effort and thought put into the subject over the years; nothing is a completely new idea, but rather drawn from all that has gone before. As I said last time, this plot tells us about the correlations between different regions of the sky. What exactly does that mean? Well, to the naked eye, the CMB map looks fairly random – some parts are blue, some parts are green, but there’s no obvious pattern. What the above graph tells us is that regions of the map separated by 1 degree are actually related to each other. The amplitude of the spherical harmonic with a "frequency" of 1 degree is very high compared to other frequencies, just as the amplitude of the sine curve with the same frequency as the A note was very high when I was decomposing the A chord using Fourier analysis. The next question to be asked is, "so what?" And the answer relates to stuff I was talking about a while ago in the posts on Gravitational Potential Wells. There, I talked about how early fluctuations in the gravitational potential created oscillations, like balls rolling in and out of a divot. In the early universe, small gravitational fluctuations of all shapes and sizes were created. These fluctuations expanded and contracted, interacting with photons to make hot and cold photons, up until the moment of last scatter when the universe became neutral and no longer interacted with photons at all, creating the CMB. What the large peak at 1 degree in the CMB spectrum tells us is precisely the size of the fluctuation that oscillated one time before the moment of last scatter. . . . While there was still much for me to learn, with the exegesis contained in these posts I was at least able to get a handle on the explanation to my queries Prof. Wright had sent me in his email reply. The terms frequency and harmonic have many applications, and my background in music had led me to assume the acoustic peak frequencies and the blackbody peak frequency were related. A similarity in the look of the two curves had informed my assumption, and the musical metaphor found on the WMAP site only served to reinforce it. But the two are different phenomena, requiring different units for their values, and in that sense as Prof. Wright said they have nothing to do with each other. Nonetheless, they are related through the subject they are describing – the creation of the CMB – which exhibits wave-like properties, and hence wavelength and frequency values. This context provides the common ground. Fourier analysis can decompose a complex audio waveform into its constituent hertz frequency values. Spherical harmonics can do the same with a complex temperature waveform into its constituent multipole frequency values. Let’s pause for a moment in case your eyes glazed over at my last statement. Understanding the existence of an audio waveform is basic to a high-school physics education. But, a temperature waveform? Such a thing exists? Indeed! And that realization came as a surprise to me, too. To see it, consider that the CMB is not a depiction of sonic fluctuations, much as the analogy to music might lead us to believe, but temperature fluctuations. And yet, these fluctuations are produced by oscillations with wavelength and frequency values, as noted above, that occur as a result of expansions and contractions in a medium, much as sound waves do. Within this cognition come even more questions as to the nature of the peaks in the temperature spectrum Hugh had included (which to further the musical metaphor were called acoustic), and what Truth within the Movement of the Universe they would provide. Fortunately, at the end of his last post Hugh had recommended for additional study Professor Wayne Hu’s excellent website7 (the aforementioned lead). For some reason, his site had not turned up in my searches, and only came to light as a result of reading Hugh’s blog! Finding it for me was like tripping over the Holy Grail. We think that fluctuations may have originated from a period of rapid expansion called inflation. Whether or not this actually happened can be "heard" in the microwave background. The fundamental tone of a musical system is related to its physical size - here the horizon size at last scattering. The photon-baryon fluid, like a gas, has pressure. In this case, the pressure is supplied by the radiation itself. If you press on a gas it will compress, but gas pressure will fight you and eventually reverse the compression. It will overshoot its original size and rarefy the medium until pressure from the surrounding gas reverses the motion again. The result is an oscillating sequence of compressions and rarefactions. Of course we don't actually hear the sound of these acoustic waves. What we actually see is the pattern of the sound waves that is imprinted on the temperature of the CMB. The final subtlety is that inflation lays down potential fluctuations on all scales. Mathematically we take the potential fluctuation in space and Fourier decompose it into plane waves of various wavelengths. Each of these wave-modes behave independently and so we can think of each individually. There is however a special relationship between the temporal behavior of modes whose wavenumbers are related by integral multiples. Now we can understand where the peaks come from. Sound waves stop oscillating at recombination when the baryons release the photons. Modes that reach extrema of their oscillation (maximal compression or rarefaction in potential wells) by recombination will carry enhanced temperature fluctuations. Let’s plot the temperature fluctuation at say the bottom of a potential well of a mode of a given wavenumber (inverse wavelength) k1. It will oscillate in time as the fluid compresses and rarefies. There is a special mode for which the fluid just has enough time to compress once before recombination. Mathematically the wavenumber (2π/wavelength) of this mode (k1) is equal to π [Greek letter Pi, an irrational number approximable as 3.14159265] divided by the distance [L] sound can travel by recombination. [k1 = 2π/λ = 2π/2L = π/L] This distance is called the sound horizon at recombination. Because the mode with twice the wavenumber (half the wavelength) oscillates twice as fast, we know that there is a mode k2=2k1 which just has time to compress and then rarefy before recombination. Likewise there is a mode k3=3k1 which just has time to compress and then rarefy and then compress again. These modes represent the first, second and third peaks respectively. They are harmonics of the fundamental scale ? the distance sound can travel before recombination. Okay, lets put this all together. 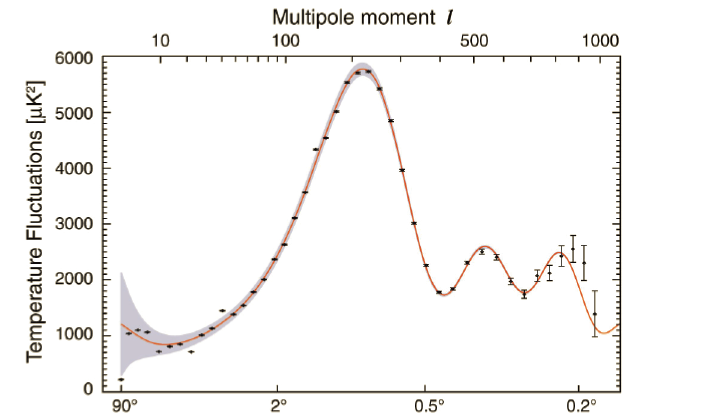 Modes caught at extrema of their oscillations become the peaks in the CMB power spectrum. They form a harmonic series based on the distance sound can travel by recombination, called the sound horizon. The first peak represents the mode that compressed once inside potential wells before recombination, the second the mode that compressed and then rarefied, the third the mode that compressed then rarefied then compressed, etc. I’d like to offer a brief view of how, for me, the process from data acquisition to final conclusions seems to transpire. WMAP, and COBE preceding it, used instruments that could measure and then determine within five (for WMAP) frequency bands a map of the CMB temperature for the complete sonic horizon surrounding the satellite. It could do this because there is a mathematical relationship between the temperature in Kelvin of each point on the sonic horizon and the frequency in Hertz measured by the instruments. Spatial variations in the temperature then determine values for the frequencies of the sound waves locked into the CMB. These are converted into spatial wavenumbers, which then define the angular wavenumbers – or multipole moments – used to plot the previous NASA/WMAP power spectrum.
. . . The results from WMAP reveal that the CMB temperature variations follow a distinctive pattern predicted by cosmological theory: the hot and cold spots in the radiation fall into characteristic sizes. What is more, researchers have been able to use these data to precisely estimate the age, composition and geometry of the universe. The process is analogous to determining the construction of a musical instrument by carefully listening to its notes. But the cosmic symphony is produced by some very strange players and is accompanied by even stranger coincidences that cry out for explanation. . . .
. . . Imagine yourself as an observer witnessing the big bang and the subsequent expansion. At any given point you will see only a finite region of the universe that encompasses the distance light has traveled since the big bang. Cosmologists call the edge of this region the horizon, the place beyond which you cannot see. This region continuously grows until it reaches the radius of the observable universe today. Because information cannot be conveyed faster than light, the horizon defines the sphere of influence of any physical mechanism. As we go backward in time to search for the origin of structures of a particular physical size, the horizon eventually becomes smaller than the structure [see illustration on opposite page]. Therefore, no physical process that obeys causality can explain the structure’s origin. In cosmology, this dilemma is known as the horizon problem. Fortunately, the theory of inflation solves the horizon problem and also provides a physical mechanism for triggering the primordial sound waves and the seeds of all structure in the universe. . . . Evidence supporting the theory of inflation has now been found in the detailed pattern of sound waves in the CMB. Because inflation produced the density disturbances all at once in essentially the first moment of creation, the phases of all the sound waves were synchronized. The result was a sound spectrum with overtones much like a musical instrument’s. Consider blowing into a pipe that is open at both ends. The fundamental frequency of the sound corresponds to a wave (also called a mode of vibration) with maximum air displacement at either end and minimum displacement in the middle [see top illustration in box on page 48]. The wavelength of the fundamental mode is twice the length of the pipe. But the sound also has a series of overtones corresponding to wavelengths that are integer fractions of the fundamental wavelength: one half, one third, one fourth and so on. To put it another way, the frequencies of the overtones are two, three, four or more times as high as the fundamental frequency. Overtones are what distinguish a Stradivarius from an ordinary violin; they add richness to the sound. The sound waves in the early universe are similar, except now we must imagine the waves oscillating in time instead of space [see bottom illustration in box on page 48]. In this analogy, the length of the pipe represents the finite duration when sound waves traveled through the primordial plasma; the waves start at inflation and end at recombination about 380,000 years later. Assume that a certain region of space has a maximum positive displacement—that is, maximum temperature—at inflation. As the sound waves propagate, the density of the region will begin to oscillate, first heading toward average temperature (maximum negative displacement). The wave that causes the region to reach maximum negative displacement exactly at recombination is the fundamental wave of the early universe. The overtones have wavelengths that are integer fractions of the fundamental wavelength. Oscillating two, three or more times as quickly as the fundamental wave, these overtones cause smaller regions of space to reach maximum displacement, either positive or negative, at recombination. To be able to discuss how Figure H-U from p. 372 of The Totality Of God has been applied to represent the illustrations from p. 48 of "The Cosmic Symphony," I need to begin by explaining what I retained from Figure H-U. First and most significantly are the waveforms themselves. Also, below each is its harmonic designation (First, Second, etc. ), with frequency and wavelength values. The context of the latter two require explanation, which I will offer shortly. I’ve also retained the axis designations from Figure H-U, though these also necessitate explanation. Next come the modifications. I have removed Realm identifications from the top of Figure H-U, which therein uphold Realm alignments in the Quadralitic Cube. As I noted early on, the Quadralitic Cube is the paradigm I derived from The Rules of Quadrality embodying all non-chaotic vibrational and rotational movement of energy in the Universe. 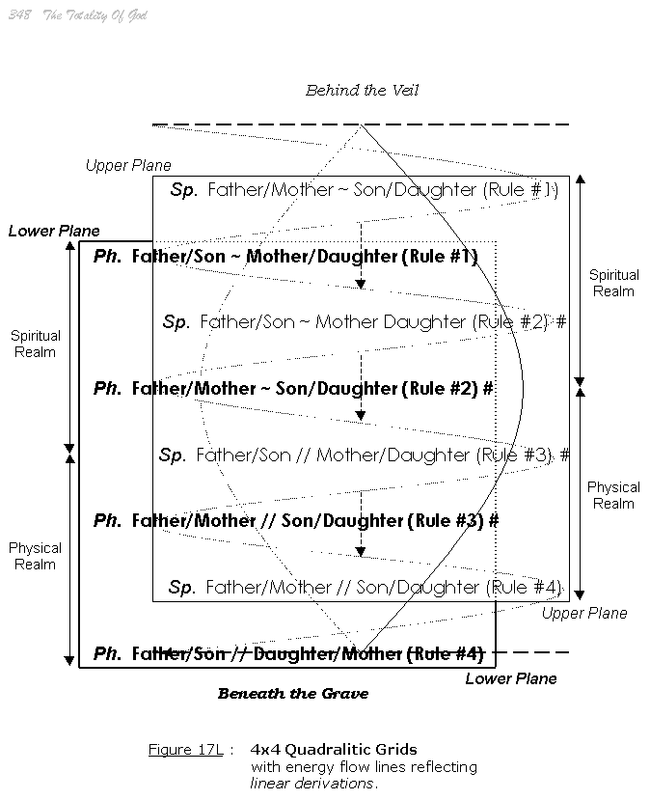 Figure 17L, illustrated on p. 348 of The Totality Of God and reproduced in the excerpt The Quadralitic Grids: Structural Paradigm for DNA, shows how these waves align within it. In place of the Realm designations is the reference to the passage of time found in the bottom illustration from p. 48 of "The Cosmic Symphony." I’ve added my own beginning and end point time references, Zero Moment and 380,000 years, in keeping with the Inflation and Recombination designations, also borrowed from the bottom illustration. Actually, present cosmological theory believes Inflation started a tiny fraction of a second after the Big Bang, while the System of Quadrality sees it starting with it. In the context of our 380,000 year timeline the issue is moot. The fact that we are discussing a timeline at all is what is significant, and I’ll clarify why in a moment. Before I do, I need to address the other aforementioned explanations. Next to each harmonic title from H-U is the corresponding wave designation from the top of p. 48. 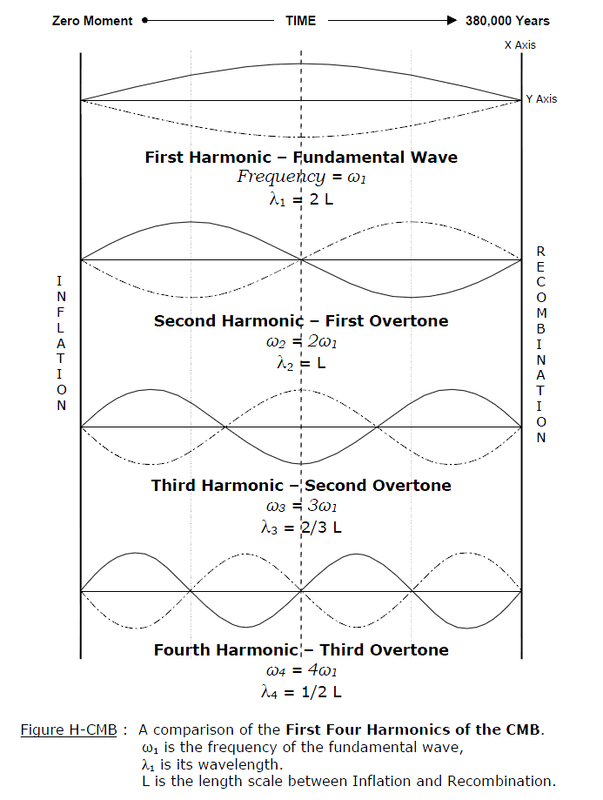 First Harmonic is equivalent to Fundamental Wave, Second Harmonic is equivalent to First Overtone, etc. There is nothing peculiar about this; it is a commonly recognized harmonic truth. In addition, I have substituted Prof. Hu’s ω frequency designation for the generally accepted sound wave designation f, used in Figure H-U. Wavelength designation λ has been retained, though it applies to the meaning of L as understood in the context of p. 48. Recall that what the scientists are measuring in the CMB is how L translates into a value for k, a wavenumber with a relationship to the size of CMB temperature fluctuations. L determines the timeline in Figure H-CMB and follows from the explanation I promised for the axes, which I’ll now detail. The distance (represented by the Greek letter Lambda – λ) between any particle in a wave and the particle in the next wave that is in phase with it. Thus, it is one complete cycle of vibration. For transverse waves, it is the distance between successive crests or troughs. For longitudinal waves, it is the distance from compression to compression or rarefaction to rarefaction. Once phase is considered, the waves are identical. The left X axis in Figure H-CMB is the wave source at Zero Moment, wherever that might be, the right X axis is the surface of last scattering, the CMB at 380,000 years. The difference in the two X axes is what warrants the TIME designation for the Y axis in the bottom illustration of p. 48, which indicates, as Prof. Hu points out, that the waves are oscillating in time instead of space. Therein lies the key to the chief difference between Figure H-U – representing any physical sound or electromagnetic standing wave in the Universe today – and the standing waves at the birth of the Universe. Standing waves today extend through space for all time, the early plasma waves extended through time for all space! What? Think of it this way. When a standing wave is created today in an oscillating system, the wave is moving through space. Since space changes, the spatial conditions of any two non-corresponding points along the wave are different. And yet, the conditions of time at those two points are the same. That is temporal truth for waves today. Of course time is transpiring as the wave vibrates. But if you were to look at those two points at the same moment in time, the space is different. Now consider the cosmic soup of the early Universe. It is defined as homogeneous and isotropic – the same composition everywhere and the same properties in all directions. That is spatial truth for waves locked into the CMB at Recombination. The spatial conditions of any two points in that soup are the same. But the time from the beginning of the Universe’s existence associated with those points would be different. Wavelength L is still a distance, based on how far sound could travel in the cosmic soup before Recombination, but it also represents duration, and the wave itself is changing through time. This is crucial to grasping the difference between frequencies and wavelengths as they are understood then and today. It underscores the point Prof. Wright was trying to make for me in his second email reply. Frequencies today have pitch, denoted by a value for Hertz, associable with a wavelength based on the velocity of that wave in its given medium. Frequencies then had multipole values determined by the angular size of the temperature fluctuations and associable with a harmonic wavenumber. That number has a relationship to wavelength as Prof. Hu stated. Scientists are not sure of the exact value of the wavelength, but since it is always the same for all temperature fluctuations at Recombination it factors out and the harmonic values are all that remain for comparison. Thus, it’s harmonic truth that is the unifying and connecting ingredient between time and space before Recombination and time and space after! We can now see why the existence of four fundamental frequencies was not included in the Theory of Harmonic Creation. No principle mandating them (as in the Principle of Harmonic Alignment), as well as no physical manifestation of that principle (as in DNA), would be possible without having the harmonic structure in place required by it. When, in May 2002, I completed the analysis of the resonant frequencies of DNA and found four that perfectly balanced consonance and dissonance, I stated that I believed it to be an essential Truth within the Movement of the Universe and a foundational manifestation of the Theory of Harmonic Creation. I then claimed that such a tonal relationship should have existed in the CMB, and the discovery of pitches in the same harmonic balance determined by their interval relationships would offer proof of my theory. Three months ago, when I began my own exploration of the CMB, it was done with that objective in mind. We all now know the result. Pitches were found, but not in a way that would offer proof. It is the same difficulty proponents of intelligent design have with pointing to extraordinarily coincidental occurrences in physical phenomena after the fact of creation and then saying they prove the existence of God. As long as there is even one chance it didn’t happen that way, there is no absolute proof, just a really good case for relative proof. The existence and evolution of the Universe and all within it can be understood in terms of the principles underlying the creation of harmonics, the perfected merging of Music and Mathematics – the spiritual and physical reflections of the same Truth within the Movement. It would be easy from a cursory glance for a scientist to dismiss this as a philosophical statement without scientific merit. Indeed, I myself have embraced its philosophic roots by referring to my exploration of the Universe’s energetic truth as Philosophysics – the integration of Philosophy and Physics. But in the second half of that title is the acknowledgement of its scientific roots, and herein its scientific application has been powerfully upheld. Certainly there are no formulas one may test to demonstrate it. Still, look at what the WMAP data has shown about the CMB. Right from the moment of the Universe’s birth, the harmonic series and therefore all the principles required for the creation of harmonics were in place. And remarkably, without being aware of my theory Science itself found the merging of Music and Mathematics to be the best way to describe the phenomenon. WMAP has since not merely confirmed the existence of the second and third peaks, but established that their monopole "frequency" values in the CMB power spectrum are in keeping with this form of harmonic evolution. 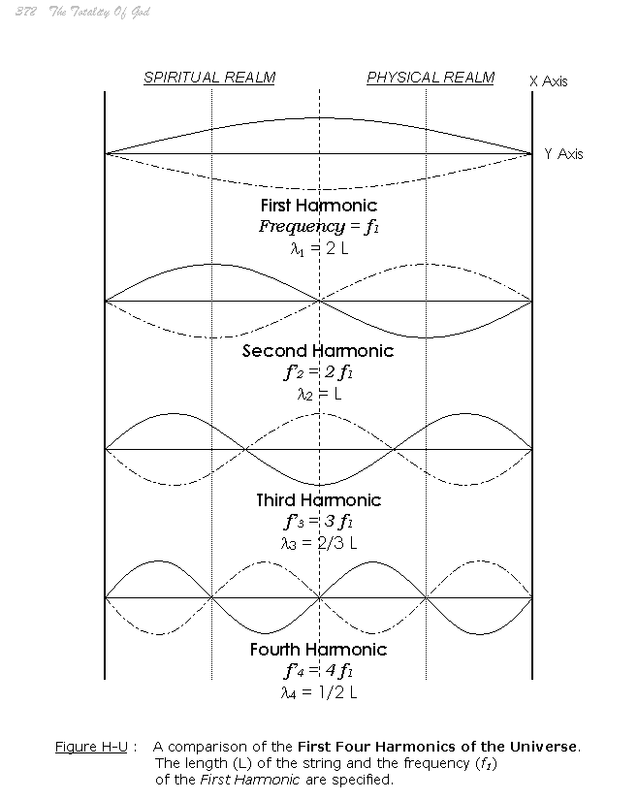 The creation of harmonics didn’t occur after the fact. Indeed, the authors explain in "The Cosmic Symphony" that they had to occur right from what I have referred to as Zero Moment. Such would have to be the case for the Theory of Harmonic Creation to be upheld as universal truth, and with the conclusion of the WMAP data analysis that occurrence has been proven. Some skeptics may look at the Theory of Harmonic Creation and say "What’s the big deal about arriving at that! It seems intuitive." Yes, it does, now that they’ve been provided with all the scientific theory and evidence to support it and allow them to mentally absorb and process it. But throughout the history of scientific discovery, at least as far as I’ve been able to see, such a basic statement of universal harmonic truth had never been made. In fact, it is only since around 2003, when sufficient CMB data had been analyzed in the 1st year WMAP results and "The Cosmic Symphony" was able to be written, that the evidence to indicate such a suggestion has existed. And even with that harmonic evidence, a connection by the scientists making these discoveries to a deeper and more far-reaching universal truth wasn’t made. There should be little argument, then, when I say nothing was in the science I was examining to write The Totality Of God that would have provided me with a direct cognition of this truth. Even in 2002, when I first proposed the Theory of Harmonic Creation, my knowledge of the CMBR was superficial, and just enough to allow me to intuitively make the observations I did concerning it in my DNA/Giza Pyramid analysis. Yet, it wasn’t intuition rooted in the established sciences but that drawing from my exploration of the System of Quadrality, begun in 1998, an original study of the energetic nature of the Universe based on the premise that there was a single truth encompassing Religion and Science. That journey had by 2002 led me to The Four Pathways to Light and Truth, the Principle of Harmonic Alignment, the Cycle of Principle and Concept, and The Rules of Quadrality, again, all original to my work. It was upon this foundation, not idle conjecture, that my intuition led me to Harmonic Creation. And Harmonic Creation was but a door to all that would follow from it. So, does the Theory of Harmonic Creation have true scientific merit? I feel this analysis has shown conclusively that it does. And once the scientific community comes to accept its simple truth, and scientists begin to apply musical principles, not just in a mathematical sense but in the sense that musicians apply them every day, a whole new level of scientific understanding and exploration will become open. After all, the harmonic series, proven now to have existed since the Moment of Creation, does not just provide for the octaves of a fundamental pitch but, as explained in Music, Mathematics, and the Cycle of Fifths, for every pitch possible in the Universe to infinity! And from the harmonic interaction of that infinity of frequencies come four that for any energetically structured system will provide the perfect balance of Consonance and Dissonance, Order and Chaos. This harmonic truth then extends into many fields. For instance, I showed that a striking tangible parallel exists between the fractal harmonic paradigm I’d established in the Evolution of Prime Numbers and the depiction published by Wikipedia19 of a fundamental’s first 31 harmonics. Consider what awaits us within the realm of 21st century possibility! None of the energetic truths revealed in this study negate the possibility that the integration of frequencies in a harmonic relationship designed to balance Order with Chaos didn’t exist or enable the incredible perfection scientists know to be true about the birth of the Universe. They only show that the CMBR can’t provide evidence for them. I still believe this was the case, and in The Evolution of Q and the Harmonic Frames of Reference I detailed the mechanics whereby this would be possible with the earliest elementary particles to form within the intense heat of the Big Bang’s cosmic broth. Yet, what the CMB does offer evidence for is quite extraordinary and the basis for all physical manifestation following from it – the Theory of Harmonic Creation. As to whether this then becomes proof of the existence of God, that conclusion is something each reader must make for him or herself. And be clear that while I am extremely grateful to have been able to share with you what the scientists mentioned herein have taught me either directly or through their writings, I have not sought their endorsement nor even asked for their opinion regarding my deduction. In its favor, Science has now proven that the Theory of Harmonic Creation, and thus the System of Quadrality following from it, was in place from the start, not after the fact. The CMB wouldn’t exist as it does otherwise. And just as a design by definition requires a designer, is it not therefore possible some preexisting, all-encompassing consciousness had begun and orchestrated the cosmic symphony? The empirical scientist would likely not care to see this data used to draw such a conclusion. The dogmatic theologian would likewise not be satisfied to see faith boiled down to a matter of harmonics. I wouldn’t be surprised by either reaction nor try to convince them otherwise, and have stated so before. But it satisfies me. What I had set out to do 12 years ago I have done. I can only hope the world will somehow benefit from it.